Kee Gate offers permanent protection for any openings, ladder or stair access points, roof hatches and other restricted areas, where regular access for maintenance and inspection is required. Kee Gates are specifically designed to provide a “retro-fit” solution to existing fixed structures where opening protection is required. The U-bolt connection allows the gate to be connected to posts from 33.7 – 48.3mm (1” – 1.5” US). Kee Gate has been designed to be fully adjustable and can accommodate openings up to 1m (30” – 39”). Connecting the “Kee Gate” to the supporting structure/post/stringer is simple via using the U-bolt which can provide connection around any flat, square or tubular stringer from 33.7 – 48.3mm (1” – 1.5”). Kee Gate is available in a range of high quality finishes. Galvanized: components are supplied with a galvanized finish to BS EN ISO 1461 and ASTM A53: Hot Dip Galvanized Coatings Specification and Testing Methods, giving an average coating of between 55-100 microns. Aluminum: products are supplied to Grade 6082 T6, & T4, Anodized Stainless Steel: products are supplied to Grade 316. All products consist of high quality tubing that seamlessly compliments Kee Safety’s safety portfolio. Kee Gate mounts easily to all variants of the Kee Klamp and KeeGuard systems as well as Safe Access Solutions such as Mobile Access Platforms & Static Access Platforms. The Kee Gate range has been specially designed with U-bolt clamps allowing the products to be mounted to the supporting structure/post/stringer. This permits connection around any flat, square or tubular stringer from 33.7 – 48.3mm (1” – 1.5”). Kee Safety Double Gate provides a self-closing option for span openings between 3 and 6 feet across. The gate can be modified on-site to suit the exact opening and is supplied with a simple screw adjustment to ensure precise alignment where both gates meet. Compliant to all relevant safety legislation, the gate does not require any locking mechanisms to be provided by the operator. 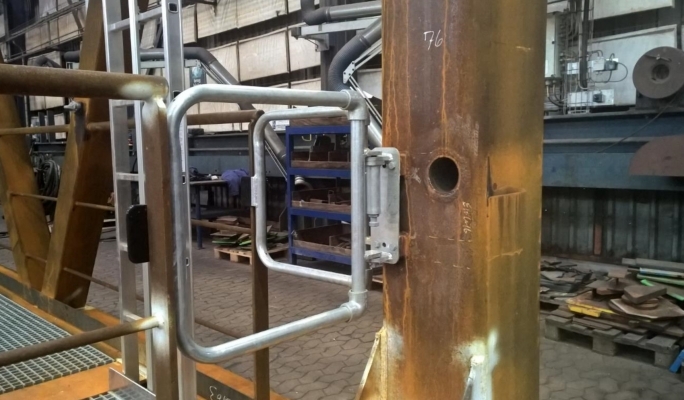 The Kee Safety Double Gate is supplied with three U-Brackets per post to ensure a secure attachment providing enhanced service life and reliability. Additional fastener packs can be supplied that allow the gate to be secured to square, flat or angle uprights. The smooth lines of the standard galvanized finish can be further enhanced by the application of powder coating to EN 13438. USA-AAMA 2603-2605. Kee Gate is available as a supply and installation service or component supply only. Products are available from Kee Safety directly or one of its licensed distributors. 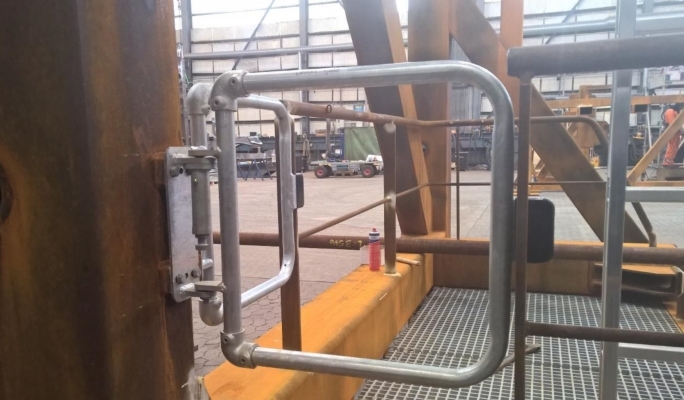 Semco Maritime is a project engineering company and they needed a safety solution to secure access to specific platforms. These platforms were used as a means by which semco Maritime would transport wind turbine blades. 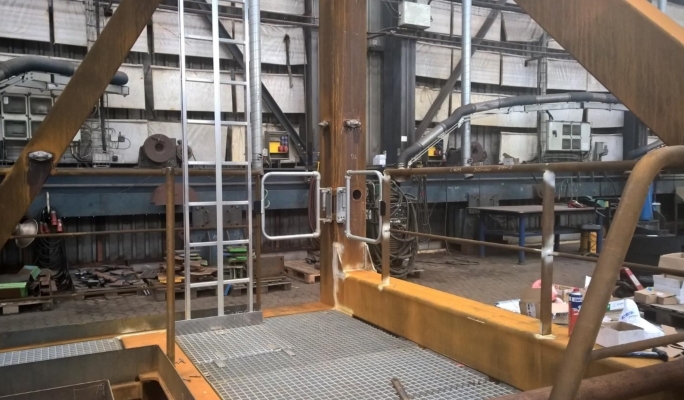 Kee Safety's Self-Closing Safety Gate served as the perfect method of access protection that would keep workers safe and stand up against the elements for the long term. Establish that the gate will close in direction of hazard. Failure to do so could result in Death or serious injury. Align the fixing plate on internal face of the opening, so that the rails of the Safety Gate match up with the top of the Guardrail System. Select the correct U Bolt & pass it through the Steel Safety Clamp & around the support leg/structure and feed through the top holes of the fixing plate. Using a 11/16” or ½” flat washer and nut connect the U bolt to the Support Leg/Structure and tighten. Select the correct U Bolt & pass it through the Steel Safety Clamp & around the support leg/structure and feed through the top holes of the fixing plate. Using a ½” or 11/16” flat washer and nut connect the U bolt to the Support Leg/Structure and lighten. Torque all nuts/U bolts to 25Nm using the 11/16” or ½” socket and torque wrench. To extend the gate’s width to the required opening simply loosen the hex nuts and bolts on the top guardrail using a 3/16” Allen Key and ½” socket. To extend the gate’s width to the required opening simply loosen the hex nuts and bolts on the bottom guardrail using a 3/16” Allen Key and ½” socket. Establish the additional distance required so the striking plate strikes the required post. Extend the gate by pulling to the required distance. Once the gate is lined and levelled tighten the hex nuts and bolts on the top & bottom guardrails using a 3/16” Allen Key and ½” socket. To tension the hinge loosen the locking nut as shown. Manually open the gate at 45 degrees from its closed position.